It was different once. To have real skis. 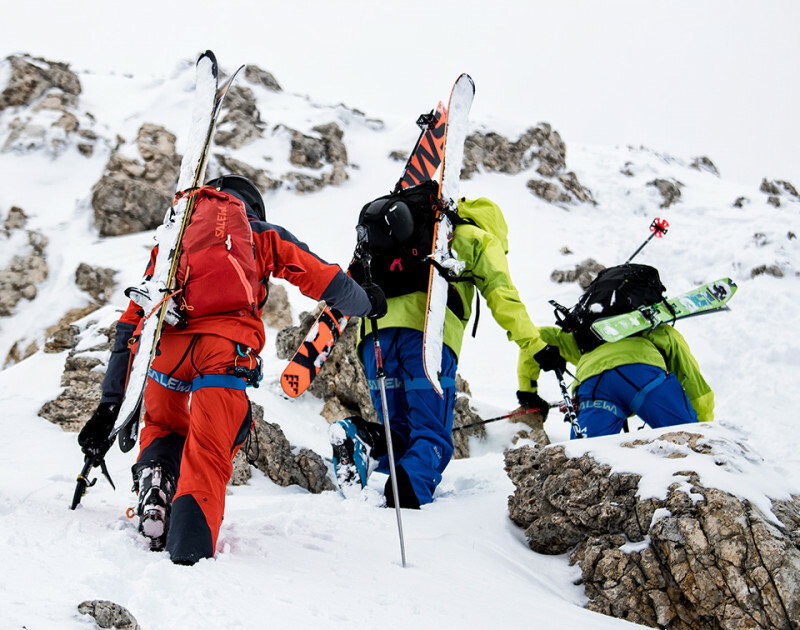 You had to be very lucky: if you had the right friends, the ones that skied with the alpine troopers, maybe every now and then you would get a pair of broken skis to fix. Maybe two different skis, and maybe all you had to do was cut off a bit if they were too long. But compared to the barrel’s slates there was no comparison. With those things you could get down to serious business, whizzing down fast and precisely just like the champions, just like Zeno Colò who went down the Little Matterhorn at one hundred and sixty kilometres an hour. All you had to do was to wear an extra jumper and you could begin to go higher, further, in those places which before used to only be majestic cornices. 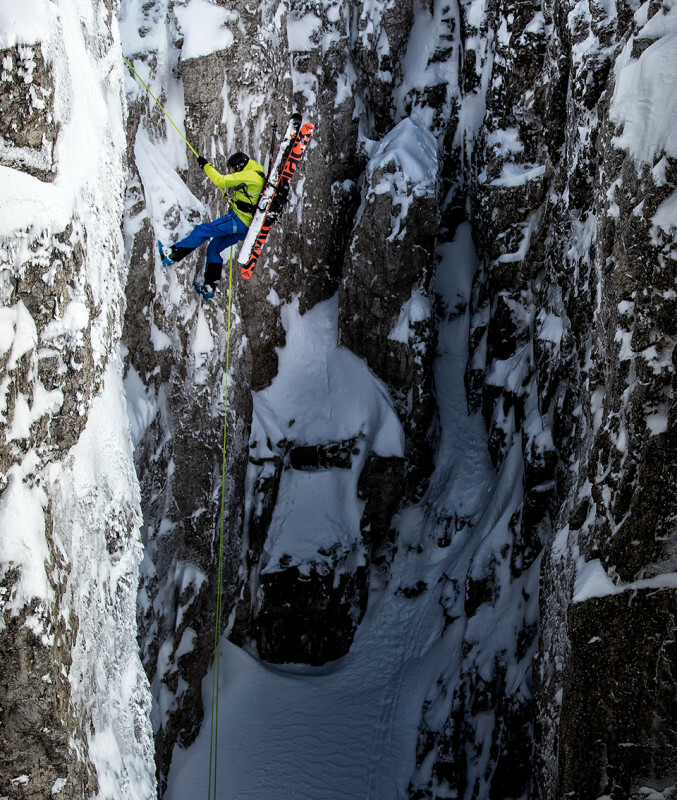 Who ever said that you cannot ski down a couloir? Arnaud is 32 years old and he has skied ever since he could stand. That’s how things work in his family. Firstly in Switzerland, on his home mountains. Then, well, the world is larger. 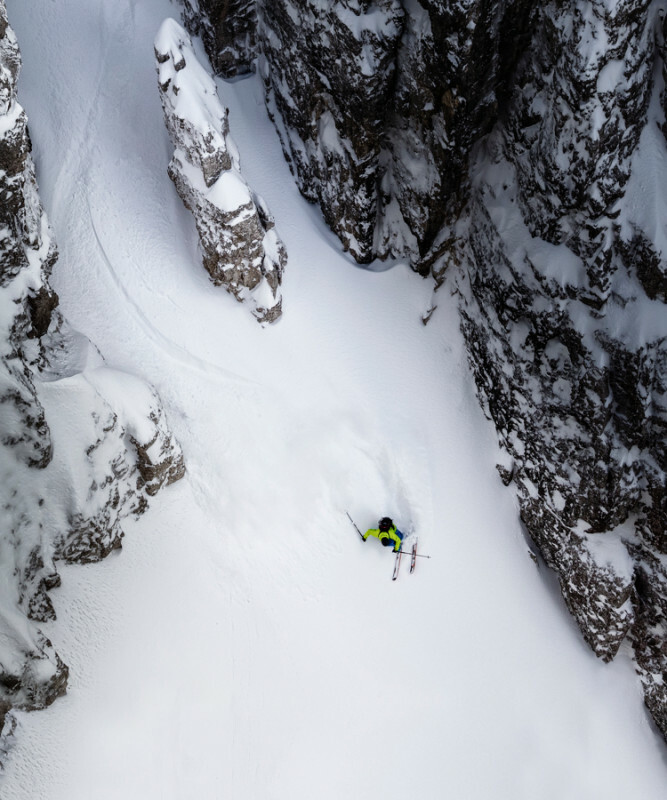 In thirty years Arnaud has skied pretty much everywhere: from the Alps to the Rocky Mountains, from Alaska to Iran. But not one year goes by, since he has discovered the Pale di San Martino, that he does not come to taste its snow together with some local friends. There are no open slopes where you have the feeling of being able to ski even further, here: these mountains are made up of dolomite and contrasts, dynamic mountains in which verticality dominates. But in spite of all this - in fact, probably, precisely for this reason - it is worth giving it a go. Couloirs as these, with such featured and playful lines, well, can’t be found anywhere. Here you have to ski big time. Eric, lagging slightly behind, stops for a moment. He is at home here: he was born in these mountains. He knows them like the back of his hands, every wrinkle, every rock. He looks while his partners climb up quickly, their outline is clad in thermal and transpiring state of the art gear, standing out in the gelid and vibrant air of expectations. He smiles and shakes his head. It is for this reason, exactly for this reason that he loves taking people to the Pale. Every time is like the first time: in their marvelled looks he finds what he felt as a kid, on his first ascents. The constant rediscovery of the beauty surrounding you is something so delicate, something to dedicate yourself with passion, commitment and love. Aaron starts to judge the descent line. 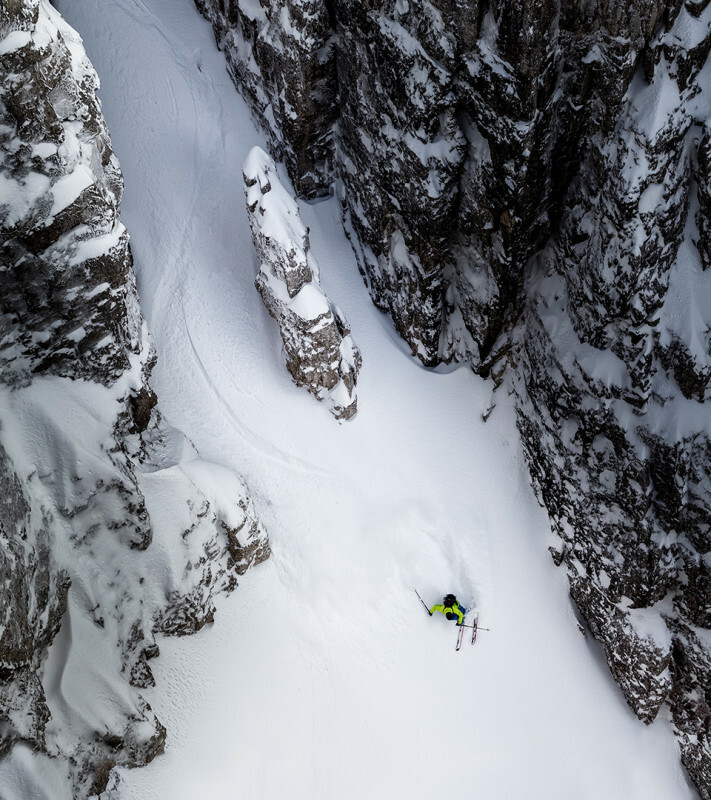 His eyes explore the snow’s surface inside the couloir, imagining the turns to draw out on that immaculate surface, to track them. He stops at the rock steps and the rocks emerging, on the narrow passages, judging their height and danger with the care of a clockmaker checking out its mechanisms. It’s no longer the forties, and every corner of these mountains has been explored. But who ever said that there is no room left for astonishment, to do something which leaves your eyes wide open and mind blown? There is always room to invent something new. It is only a question of perspective, of interpretation. Aaron looks down to the village, at the bottom of the valley, which still lies in the shade. He breathes in a breath of sky. He sniggers and starts to rummage in his back pack. Silence. Only the delicate sound of increasingly narrow turns cut out by three pairs of skis slices through the air with regular harmony. A small speedriding sail opens up, rustling. Arnaud and Eric slow down, aiming, cautiously to the left of a drop which is definitely too high. Aaron doesn’t. Aaron lets his skis slide, aiming exactly towards that direction. His eyes squint, as he concentrates. He bends his legs slightly, picking them up. He holds his breath. He no longer has snow beneath his skis: now, nothing but air runs along under the base of his skis. A few seconds, then powder lifts up all around, soft and shiny. 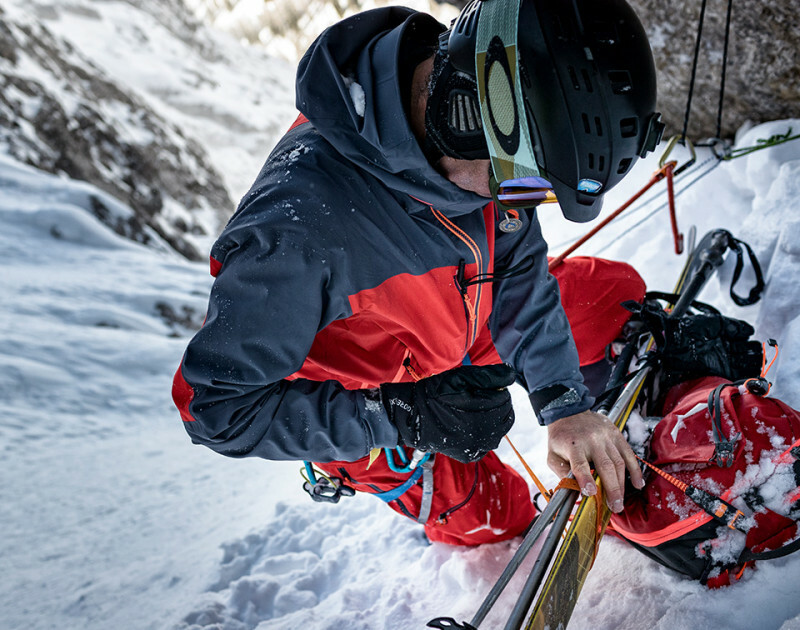 Every ski mountaineer has looked for the perfect line sooner or later. Yes, because sooner or later it happens: after a descent you turn around, look at the vanishing tracks your skis have left behind. You follow them with your eyes, turn after turn, listening to the emotions and feeling that your body reminisces, and you ask yourself: “Was this the perfect line? The best I could trace?”. Probably the perfect line does not exist. Probably, because dogmas belong only to fundamentalists. 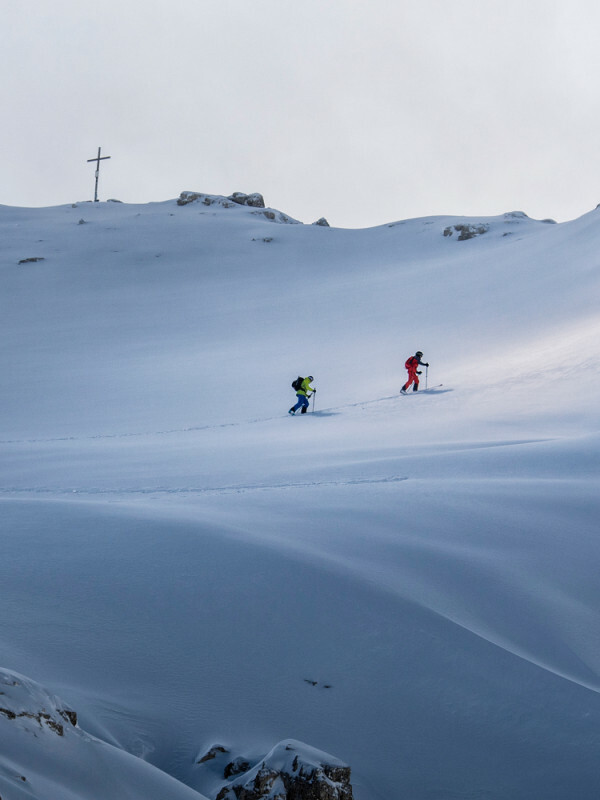 Probably every descent is perfect, and it doesn’t matter if you ski down the steepest couloir you managed to find, on your own, or with your best friend. Probably every line is perfect: because at the end of the day you know that while you were skiing it, turn after turn, accompanied by the swooshing sound of the snow and your heart beat, you lived life exactly as you wanted to: free. But their thoughts, their dreams, their wishes, flew away, far away, towards those clear clouds: the first snow flake was an event. Then it was simply a matter of waiting, and in just a short while it would be time for skiing. Skiing, well let’s not exaggerate. It was more a matter of collecting a couple of decent wooden slates from a broken barrel, hammer something onto them and even if unlikely, could hold one’s feet (old slippers secretly stolen from an aunt were perfect, for example), and then off they went. There were no ski lifts here. There were no helicopters, and no snow mobiles. There was just about nothing. That, and these incredible mountains. But who ever said that there is no room left for astonishment, to do something which leaves your eyes wide open and mind blown? There is always room to invent something new. It is only a question of perspective, of interpretation. Aaron looks down to the village, at the bottom of the valley, which still lies in the shade. He breathes in a breath of sky. He sniggers and starts to rummage in his back pack.